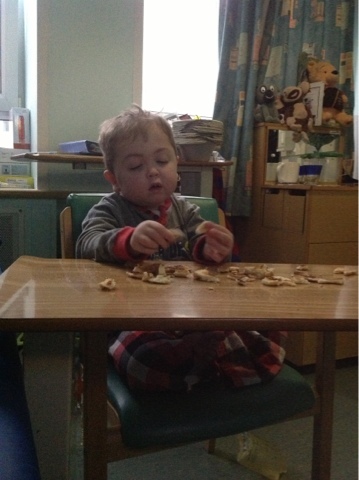 Harvey's Journey : Out Of Bed Playing With Toast . . Surely today can't go much slower!! What a long day it's turning out to be, probably because I've been up since 6. Mummy opened the windows in the room last night because the silly works people have turned the heating on, I think they're trying to cook us!! These cubicles are either really cold or boiling hot, and now, because they've turned the heating on we are all moaning because its really sickly hot and everybody has headache! We woke up freezing this morning though because at some point the heating went off and with both windows open it was a bit arctic. I'd much prefer that though to how it is now! So how am I? . . Well last night I was in oxygen again, I've managed the day without it today. Respiratory just want to wait and see how things go and if I'm still needing it by Thursday then i'll need to do another overnight trace and see how that one goes. If it turns out on the days I've had traces done I didn't require oxygen but need it intermittently I between they'll discuss seeing if its worth betting it put in at home for those times because they know there's some days/nights when I need it. Each day is different with me, it's another thing I like to do my way!! My bloods today show that I'm not dry like I was yesterday so the extra fluid I had helped with that. The immunity markers in my bloods have fallen today and also my cell count so I'm either brewing another infection or its another problem we need to look into. Because its me though and I like to keep people guessing, they won't know just yet! Been playing with my Lego today, also my wooden jigsaw, and doctors badges I can get hold of and I was sat at a table earlier playing with toast. I've got Becky again today, she keeps coming in for cuddles and Salina is back too. Salina came in first thing this morning to see me, she's another one with a soft spot for me. She makes me smile. I've got a good bunch of ladies so can't really complain :). I'm still getting pain today, been laying down a lot with mummy. We watched hop earlier. Now I'm going to go lay down for a little while because I'm a bit tired.